Nine thousand years of canoe paddles! • how do the surface areas of paddles from around the world compare? 200 pages. A5. Spiral bound. UK customers: buy the book for £18 plus £3 postage. Rest of the world: buy the book for £18 plus £8 postage. UK customers: buy the book for £10; including postage. Non-UK customers: buy the book for £14.00; including shipping. About a year after the publication of my book, Making Canoe Paddles in Wood, David contacted me with the idea of collaborating on this new project. He had been working on such a book for quite a while, but felt blocked, and welcomed a little input from someone making paddles using contemporary techniques, to complement his material on paddlemaking in the native tradition. The challenge was to make the new book suitably different from Making Canoe Paddles in Wood. 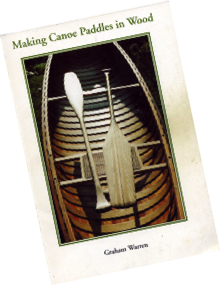 I set out to write a more focussed "how to" book, in contrast to the first book which is discursive in style, containing anecdotes, paddle lore and historical notes on the paddle designs described. The books contain different sets of paddle plans. 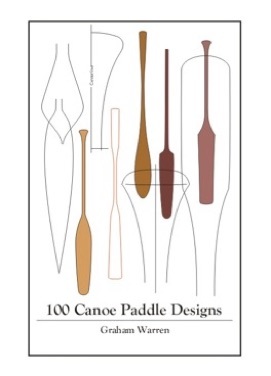 My section of Canoe Paddles took four months to write, from September to December 1999, and 2 months to illustrate. The line illustrations were drawn using CorelDRAW! 7. 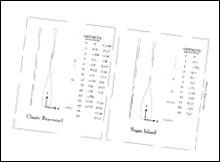 Most of the paddle illustrations were scanned from photos or tracings of the original paddles, so they are quite accurate. I took the cover photo perched up in our large ash tree with the paddles arranged on the ground beneath me. We scoured the garden for every scrap of wood to make the background. Just after the photo was taken, I slipped from the icy ladder but managed to catch a rung with one hand as I swung underneath, with the camera dangling from the other. During the same cold spell, we had to break ice on the Caldon canal to get the overhead shot of the Peterborough. You can also see the cold reflected in the pinched and blotchy hands that appear in many of the photos. I succeeded in getting photos of all the family into the book, mostly close-ups of their hands whilst making paddles. The picture in the Child's Paddles section is of my daughter Sarah, age 7, still smiling (just) after a canoe trip across Scotland from Fort William to Inverness under difficult conditions. The expanded edition appeared in 2015, and includes a colour section of design ideas. Making the paddles for these photos and taking the pictures occupied an intense six-week period during August-September 2014.